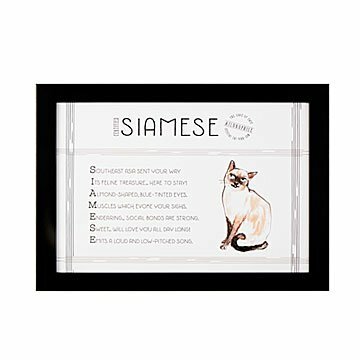 Unique from head to tail, this artwork features an poem celebrating your kitty's special traits. Your fur baby rules the family, and this artwork poetically says you wouldn't have it any other way. Unique from head to tail, each design features a playful acrostic poem celebrating your kitty's special traits—from the piebald who will "dote on your every scratch and pat" to the tortoiseshell who is "often feisty... seldom wrong"—and a fetching illustration. It's stamped with an "Ailurophile" seal: aka "official cat purr-son". Poems by Martin Geller. Illustration by Patricia Carlin. Printed and framed in Portland, Oregon. Click here to see our Cat Composition Tote and Cat Composition Pillow.